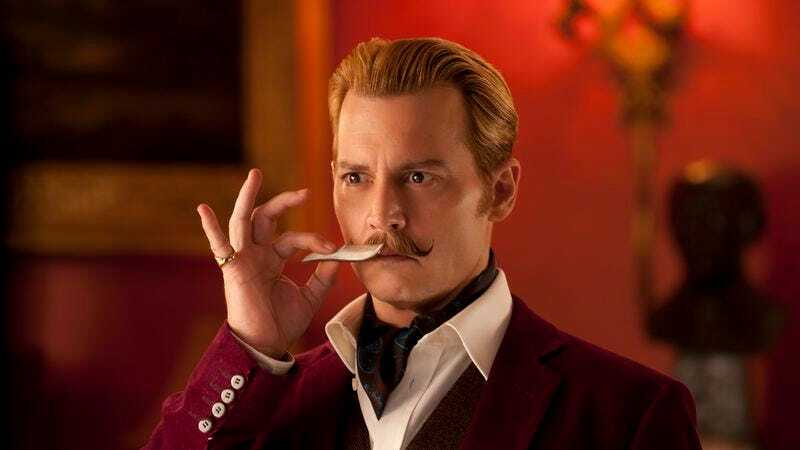 When Lord Charlie Mortdecai (Johnny Depp) introduces himself first and then his twirly, recently grown mustache, the good-taste brigade, always wondering when Depp will quit goofing around, may begin to feel nauseated. Their nausea probably won’t subside at any point during Mortdecai, in which Depp plays an old-money British fop, a man of considerable erudition and questionable taste who moons over ridiculous paintings. In debt to the British government to the tune of £8 million, Mortdecai is approached by his old MI5 frenemy Martland (Ewan McGregor). Martland implores Mortdecai to put his knowledge of the “filthy underside of the art world” to good use by locating a stolen Goya painting. Mortdecai takes place largely in England and revels in a cartoon Englishness, but its two leads are both American: Gwyneth Paltrow revives her Brit accent as Mortdecai’s wife, Johanna, creating a kind of faux-British symmetry of fakery. The artifice goes further when even the movie’s major U.K. actors don’t use their own accents: McGregor tamps down his Scottishness and Paul Bettany goes cockney as Jock, Mortdecai’s loyal ruffian of a manservant. Jock serves as Mortdecai’s brawn, while Johanna assumes the role of brain, conducting her own parallel investigation (in part by teasing information out of the besotted Martland). Mortdecai himself keeps busy without contributing much: chastising, condescending, throwing around words like “chap” and “old bean,” and preening over his facial hair. Johanna puts up with her husband’s general nonsense but expresses horror and disgust when she lays eyes on the mustache he displays so proudly. Most people Mortdecai encounters echo that disgust, and his stubborn self-appreciation in the face of this widespread disapproval—even when it threatens his relationship with Johanna—becomes an inspired running gag, one that can be read as meta self-commentary on its star (though this reading isn’t necessary for it to work). Essentially, the comedy-of-remarriage portion of Mortdecai is premised on an argument over an affectation. In the context of faked accents and intentionally absurd plotting, that affectation becomes not a crutch of the movie but a motif. Depp, then, finds an ideal vehicle for a quality that has become undervalued: his joy of performance. As much as he appears to run wild through the movie, Mortdecai is a clear collaboration, not a one-man show. It reunites Depp with David Koepp, who directed him in Secret Window (where Depp, coincidentally, played a guy named Mort). Koepp is an oft-employed screenplay writer who sidelines in directing efficient workouts in genres as varied as chase thriller (Premium Rush), romantic comedy (Ghost Town), and horror (A Stir Of Echoes). Here, directing without an accompanying screenplay credit for the first time, he tries his hand at a comic caper (based on the first in a series of novels by the late Kyril Bonfiglioli), which may not go down as his specialty. Many of Koepp’s screenplays have funny moments, but he’s not especially known for his verbal wit, and some of Mortdecai’s running gags slow their way into obviousness. But Koepp, always a crisp filmmaker, does excel at finding comedy within his frame, whether he’s capturing Depp, McGregor, and Paltrow reacting to each others’ love triangulations or placing bits of slapstick action in the background to both downplay the movie’s suspense and emphasize its ridiculousness. Not every farcical piece locks into place. Two Americans allowed to use their own accents, Jeff Goldblum and Olivia Munn, enter the picture too late to get much to do, and Depp plays off Paltrow and McGregor so well that their frequent separations seem a shame, however thematically or narratively appropriate. Like a lot of Koepp’s films, Mortdecai doesn’t transcend its genre—and it doesn’t have well-honed thrills or emotion to fall back on when it stumbles or meanders. It’s exactly the sort of oddball trifle, like Hudson Hawk, that tends to attract the ire of baffled audiences and grumpy critics. It’s also the sort of oddball trifle that, like Hudson Hawk, will put certain aficionados of silliness in a pretty good mood.